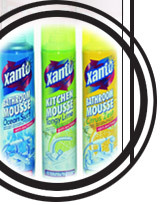 melanie rose, household products, cleaning products, haircare products, pound lines, Melanie Rose, Melrose, Xanto, Pro-Vita, Power Activ, salon haircare range, Bathroom Mousse, Kitchen Mousse, Carpet Mousse, Stain Removing Mousse, Pet Stain & Odour Removing Mousse, WC Mousse, Oven Cleaner. Window & Glass Cleaner, Air Fragrance, Furniture Polish, Multi-Surface Polish, Fabric Refresher, Hairspray, Styling Mousse, Styling Gel. We have over 20 years of experience in marketing well-formulated, quick-sale product lines, and fully understand our Customers' needs.Our Customers range from large chains to individual shops, and from the biggest to small family wholesalers throughout the country. We supply some of the top names in the household and toiletries market, and value every one of our Clients, large or small. We take pride in offering Expertly formulated products with sound technical support , Best value can sizes - the largest can which will fit on shelf, filled to the highest capacity possible to retail at the magical £1 price point , Innovative, eye-catching design concepts to set us apart from the rest, A product package as good as the brand leaders, but which retails at half their price as well as in a can often more than double their fill, Why pay twice as much for a leading name brand in a smaller can, to subsidise its advertising budget? Brand new 'First in the market' product lines which we can now develop and launch even before the brand leaders. Our unique innovative ideas enable us to leapfrog and forge ahead of our competitors. We are adventurous, but never compromise the quality of our products, as all are stringently tested prior to launch. For our UK Customers, delivery within one to two days is what sets us apart from our competitors. Orders delivered within 48 hours. If Customers require delivery on a set day and time, we pride ourselves on meeting Your requirements without shortages or delays. Our commitment to Customers is to give a prompt response, whether it be for goods, product information, pricing, samples, brochures, or whatever else You may need. Personal service is what matters to us, however small our Customer, wherever you are based. All our products have a shelf life of three years. We have 25 years of export experience to service Your company wherever You are. We've despatched thousands of products to hundreds of satisfied Customers. We've worked hard for that reputation. We are working even harder to keep it.